Thunder Bay Press, 9781607102816, 80pp. Make your money into something more! 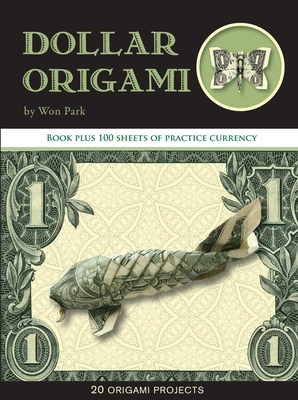 With Dollar Origami, you'll learn how to fold your dollars into frogs, scorpions, and other creatures and objects. We handle money every day. We're used to handing over a few bills for a coffee or a few more bills for a book or a new item of clothing. But it's fairly rare these days to be able to turn just one dollar into anything. A dollar won't buy you a camera or a shark--but there is a way to make it into one! Dollar Origami teaches you how to turn your currency into almost anything with just a few folds. With simple instructions, full-color photos, and 100 sheets of paper to practice on before you use your own money, you'll be crafting beautiful butterflies, adorable penguins, and more in your own home in no time. Sometimes, your money can go farther than you think--and with Dollar Origami, it can also provide you with much more fun! Won Park was born in Korea and moved to the United States when he was three years old. Origami was an important part of his life from a very young age. Won started folding paper when he was 6 years old. His first mentor was his mother, who taught him very simple models. As he got older, he started to study origami from books he borrowed from the library. Won started to fold money when he was in middle school. He found the paper used to make the dollar was the ideal folding medium, since the paper is very resilient and strong. Since then he has specialized in folding money.